This easy, no fuss cake is deeply chocolatey (such a good thing! ), with the sharp citrus kick of candied orange and a warming hint of spice. 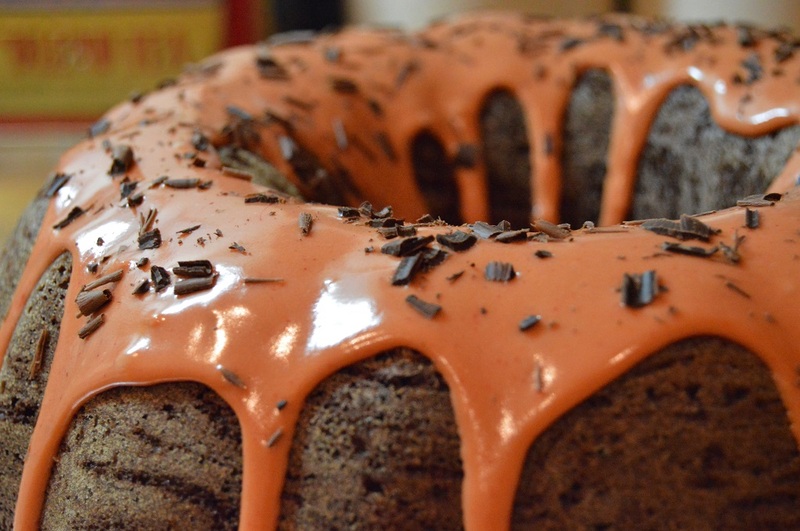 This is my first ever bundt, so I feel I am coming very late to the bundt party that has been something of a craze for the past few years, but I felt it was time to make one! 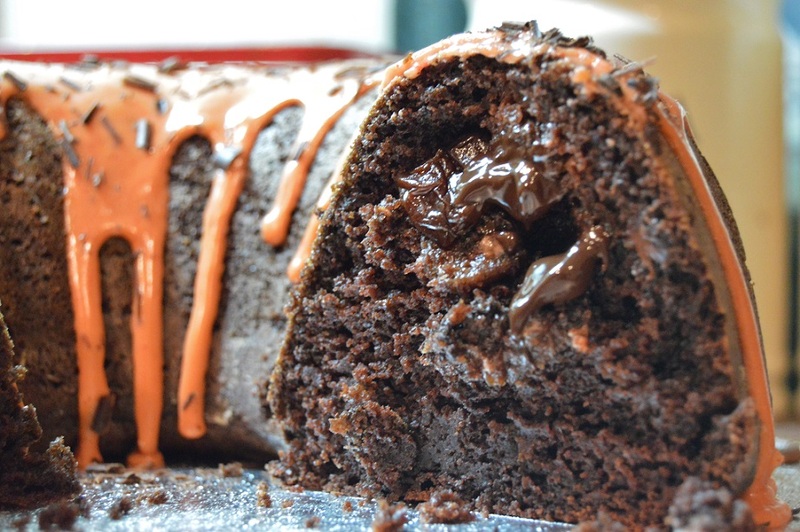 And I feel a bundt does need a sticky icing. 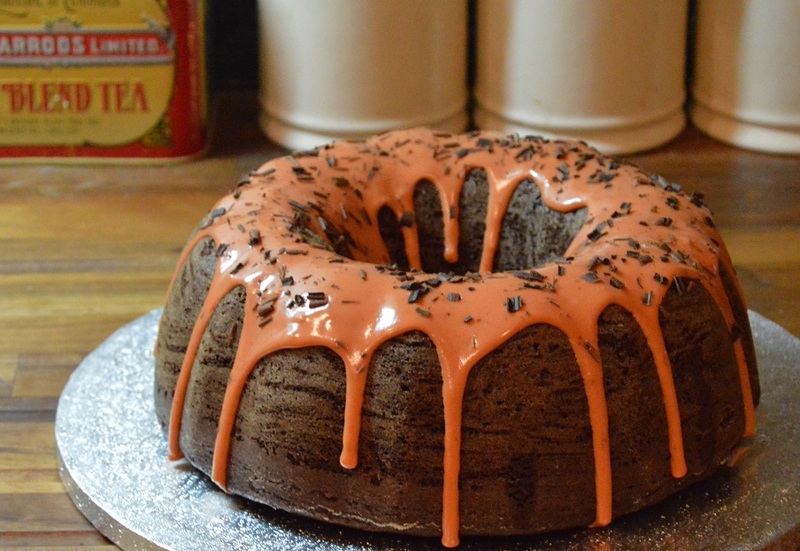 I had ordered one of those stunningly shaped bundt tins, the type that looks like an ornate cathedral with many sharp crevices and the like, but when I wanted to make this particular bundt, the tin had yet to arrive – so in its place I used a slightly fluted ring tin, with a capacity of about 2½ litres. Recipe-wise, I adapted a handed down recipe I use for chocolate fudge cake, resulting in a very moist cake with bags of flavour. With the spices and the orange, this cake is particularly special at Christmas, but it is a lovely cake at any time of the year. Candied oranges give a wonderful sweet-sharp flavour in cakes, like little citrus gems lurking in every bite. You can buy caramelised or candied oranges online, which are terrific used in this cake, or you can use good quality candied orange peel from the supermarket. For a simple home-made version: gently simmer together peeled and chopped orange rind with water and sugar for about 30 minutes until the peel is soft, before reduced the syrup intil it becomes thick and just starts to caramelise. The proportions do not need to be exact, but for every orange, use about one pint of water and about 100g of caster or granulated sugar. Just keep an eye on the simmering syrup as you don’t want it to burn: if it starts to get too solid, add a splash of hot water. You then turn the orange peel onto baking parchment or a silicon sheet to cool. Butter the tin generously, making sure you go into all of the crevices – melted butter is excellent to get right into the crevices. Add a couple of tablespoons of flour and rotate the tin backwards and forwards so that it coats all of the butter. Invert the tin so the excess flour drops out. As the cake bakes, the flour will form a very thin layer between the cake and the tin, that helps it turn out easily. Once the cake has baked, leave it in the tin for about 15 minutes before turning it out onto a wire rack: the cake sets further and shrinks a little as it cools. It is easier placing the rack on the top of the cake and inverting both together. It might need a gentle shake to help it on its way. (1) Preheat oven to 150C. Butter a Bundt tin generously and dust with flour, ensuring you coat the inside fully. Tap out the excess flour. (2) Cream together the butter and sugar for a couple of minutes until very light. Sift the flour, cocoa, spices, bicarbonate of soda and salt into the bowl and add the soured cream, eggs, grated orange zest and chocolate. Mix well to give a smooth batter. (3) Spread about half of the batter into tin. Scatter half of the candied orange pieces and half of the chocolate on top, making sure they don’t touch the sides of the tin, and lightly press some of them down into the batter a bit. Cover with the rest of the cake mixture, coming to about three-quarters up the tin, and scatter over the rest of the candied orange and chocolate, pushing a few of those into the batter. Make sure all of the orange and chocolate are covered. Level off. NB: if you have mixture left over, spoon into cupcake cases and bake for about 15-20 minutes. (4) Bake for an hour: it will be well risen, with a natural crack along the top. Cool in the tin for 15 minutes before turning out onto wire rack to finish cooling. (5) Make the icing: mix the icing sugar and enough orange juice to give a thick, smooth icing that just holds it shape and slowly drips off the spoon. Spoon over the top of the cooled cake and allow a little to drip down. (6) Decorate with chocolate shavings and/or small pieces of candied orange.